This Sunday’s Blues Session at the Hope Tavern in Holton le Moor (February 4) sees the return of singer, songwriter and inspiring guitarist Sean Webster, along with his band. Originally hailing from the Retford area, Sean played the Tavern several times in its early days promoting Blues gigs and has never failed to bowl the audience over with his musical talents and his rich, powerful vocals. Sean is an inspiring guitar vocalist with a great reputation on the British blues and rock scene. His vocal style has a rich tone with a low end rumble drawing comparisons with Joe Cocker, Bryan Adams and Jonny Lang. 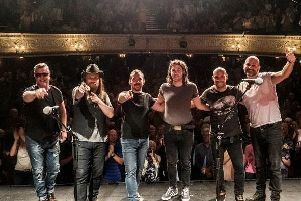 Having left the UK a few years ago to base himself in Holland and the heart of European Blues scene, Sean regularly tours the UK and features at many of the major festivals - including Burnley, Maryport and Colne. He has also played tours in the USA Australia and Europe, as well as performing live sessions on the Radio 2 Paul Jones show and on national Fox TV in the USA. This is the first date on this Uk tour and introduces a new “all Dutch” line up in support, which augers well for a great evening of Blues at the Tavern.